"Sampath Speaking" - the thoughts of an Insurer from Thiruvallikkeni: India play Serbia in Davis Cup.. bread & butter keep the top stars away from Asiad !!!! India play Serbia in Davis Cup.. bread & butter keep the top stars away from Asiad !!!! 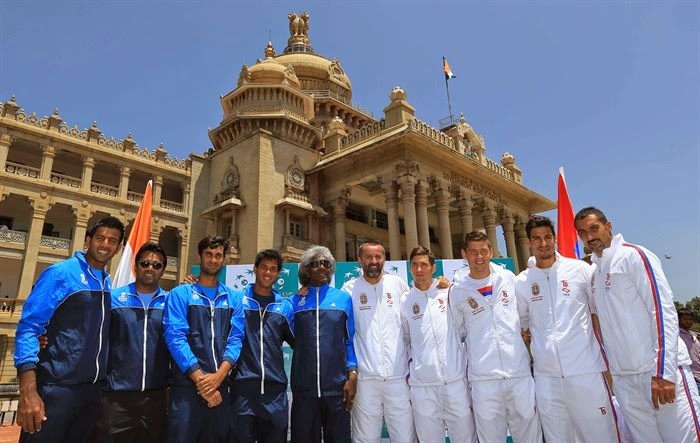 The Indian team arrived at the Vidhana Soudha, Bengaluru - seat of the state legislature, for the ceremonial draw. The players took turns, posing before the grand edifice that bore the words `Government work is God's work', clicking selfies. Karnataka Chief Minister Siddaramaiah set the ball rolling by pulling out the 22-year-old Bhambri's name from a cut-open tennis ball that decided the order of play for Friday. In what is largely perceived as a pick that favours India Bhambri, ranked 151 in the world, will take on Serbia's no.1 Dusan Lajovic, 61. If you are wondering what this is all about – 2013 finalists Serbia have travelled to India looking to continue its seven-year-long presence in the world group. This is unusual territory for this Serbian team, which has made the quarterfinals or better every year since 2010. For India, this tie represents a chance to return to the Davis Cup's top table, having spent 2012 and 2013 in Asia/Oceania Zone Group I.
Davis Cup is the premier international team event in men's tennis. It is run by the International Tennis Federation (ITF) and is contested annually between teams from competing countries in a knock-out format. The competition began in 1900 as a challenge between Great Britain and the United States. By 2013, 130 nations entered teams into the competition. The most successful countries over the history of the tournament are the United States (32 wins and 29 times runners-up); and Australia (28 wins that include 4 with New Zealand as Australasia) The present champion is the Czech Republic, which beat Serbia to retain the title. The women's equivalent of the Davis Cup is the Fed Cup. Australia, the Czech Republic, and the United States are the only countries to have held both Davis Cup and Fed Cup titles in the same year. India competed in its first Davis Cup in 1921 but is yet to win the Cup. India finished as runners-up 3 times (1966, 1974, 1987). In 1974, the final was scratched and South Africa were awarded the Davis Cup after India refused to participate in the final due to the South African government's apartheid policies. India have been in impressive form in this year's competition, securing a 5-0 win against Chinese Taipei in the first round before defeating Korea, Republic 3-1. Serbia will undoubtedly present a greater challenge for the Indian team. India’s Yuki Bhambri, a former world No. 1 junior, ranked 151 in the world, will take on Serbia’s No. 1 Dusan Lajovic, ranked 61, in the first match of the Davis Cup by BNP Paribas World Group play-off tie at the Karnataka State Lawn Tennis Association courts from September 12. In the second match, also to be played on the opening Friday, the host nation’s No. 1 player Somdev Devvarman, ranked 143, will take on Serbia’s No. 2 Filip Krajinovic, ranked 108. In Saturday’s doubles action, India’s veteran star Leander Paes, roped in at the last minute to play the tie, takes Saketh Myneni’s place in the four-man line-up, and will partner Rohan Bopanna against doubles specialist Nenad Zimonjic and Ilija Bozoljac, who replaced world no.1 Novak Djokovic from the Serbian side after the 27-year-old pulled out of the competition due to fatigue. In the reverse singles on Sunday, Devvarman will play Lajovic in the first of the rubbers, in the clash of the No. 1 players, while Bhambri will go up against 22-year-old Krajinovic. Teams have until one hour before the start of play on Saturday to change their doubles combinations, while on Sunday captains can change the player for the fourth rubber up to one hour before, and for the fifth rubber, ten minutes after the end of the first match. Yuki, who was sidelined with a heel injury for five months, returning to the Tour only in August, said he was aiming to starting with a win. As we fervently hope for the Indian win, the hopes for Team India has receded in Incheon Asiad, as top players have preferred to skip the tournament, to concentrate on ATP tour and gain rankings, rather than playing for the Nation. Somdev DEvvarman first announced his decision to pull out. Rest have followed the suit. Now the Team would be : Yuki Bhambri, Saketh Myneni, Sanam Singh, Divij Sharan. In women - Ankita Raina, Prarthana Thombare, Natasha Palha, Shweta Rana, Rishika Sunkara. When some questioned their commitment to country in not playing for the Nation in Asiad, India's top tennis players tried to put their decision in perspective by saying that they had an obligation to earn their "bread and butter"